Plans for the first ever Upton-upon-Severn Coach Day are now taking shape and the UK tourism industry are invited to see for themselves. It’s to be called Coach Stop Upton. Part of the beautiful Malvern Hills area in Worcestershire, the Upton-upon-Severn and Malvern Hills Coach event takes place on Sunday 10th and Monday 11th September. Arranged by Malvern Hills District Council and coordinated by travel trade specialists Steve Reed Tourism Ltd, the set piece aims to showcase how good this beautiful town is for groups and coach parties. And although this unique event is all about coaches, the attendees will also have the opportunity to witness a sporting spectacle featuring just two wheels. Stage 8 of the OVO Energy Tour of Britain Cycle Race passes though Worcester and Upton upon Severn. Upton-upon-Severn is a small town in the Malvern Hills district of Worcestershire. Situated on the west bank of the famous River Severn, Upton is thought by many local tourism businesses to be ‘a perfect coach stop’. The attendees will be hosted in the Bank House Hotel, Spa & Golf Club in nearby Bransford Village. The Bank House is a beautiful 61 bedroom family owned hotel which has a relaxing spa with panoramic views of the Malvern Hills and an 18 hole Florida Style golf course. The group will enjoy a fact-finding tour of Upton and Great Malvern. 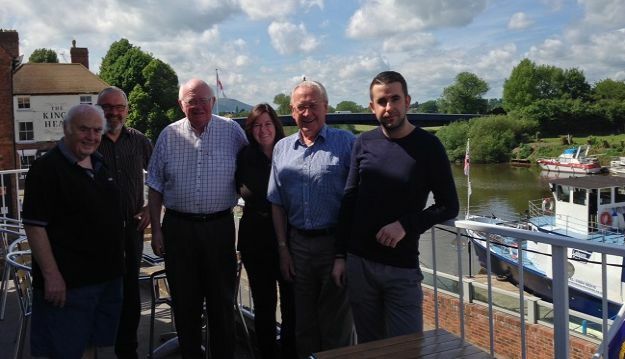 One of the highlights will be a trip on board the Conway Castle river boat, boarding of course at The Boathouse in Upton-upon-Severn. The area and its attractions are just made for groups. Upton-upon-Severn also hosts an impressive array of award winning festivals each year. These include the Folk Festival; Jazz Festival; Blues Festival and the very popular Sunshine Festival. It’s also famous as the site of the Battle of Upton during the English Civil War, visited by Oliver Cromwell. And its Tudor House Museum attracts lots of visitors. The town is blessed with regular boating trips arranged by Severn Leisure Cruises – passengers can enjoy relaxing trips to the nearby cathedral city of Worcester or to Tewkesbury. They also do their very popular afternoon tea/fish and chip lunches/Sunday lunches with jazz or blues live bands. Upton itself has many beautiful 17th century buildings, none more prominent than the iconic ‘Pepperpot’. This is a distinctive medieval church tower crowned by a cupola instead of the usual spire. The town’s location beside the river and within the picturesque Malvern Hills, very near to the famous spa town of Great Malvern, has meant that Upton has grown in importance to the travel and tourism industry. ‘The event is a great way for tour planners to see the full potential of Coach Stop Upton,’ says Steve Reed of Steve Reed Tourism Ltd. ‘It has everything you could possibly require for coaches and groups.’ Any coach and tour operator wishing to attend the Upton-upon-Severn and Malvern Hills Coach event should email steve@stevereedtourism.co.uk or telephone  560 288.